I really love to do cover-up’s. It’s always a good challenge, to work the old tat into new one, making an illusion. With the dotwork & geometry tattoos it’s even a more of a challenge, cause those designs have a lot more air in them. Although, lately I like more and more the cover-up’s where the new tattoo is just a second layer, so the old & new kinda mix together. 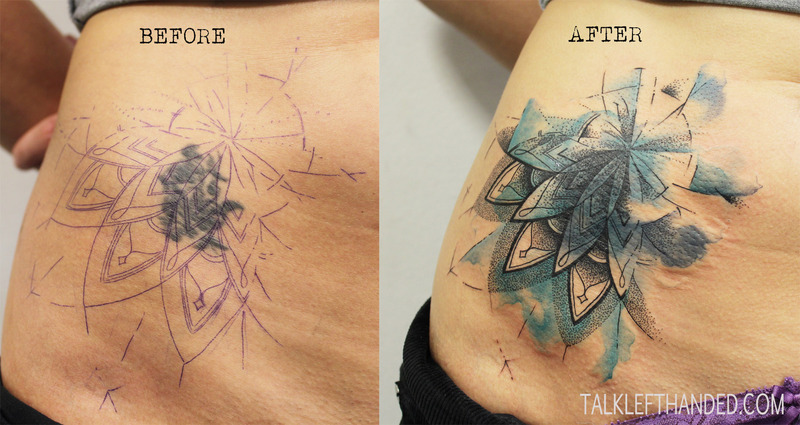 Anyway, did one cover-up again today, it had all my favourite techniques in it – dotwork, geometry and watercolours.